Transcribed, with diagrams and arbitrary headings by J. Bailey. Editor’s comments are in square brackets [ ]. Eugene begins by reading a question handed to him on a slip of paper prior to the talk. ... we should expect to resolve many inconsistencies in our psyche. Now, actually this isn’t true. We shouldn’t expect anything, other than what occurs. Now, we should beware of the words should, ought and must. · and aught implies we’ve got the power to do. Now if we just listen to a truth — and the truth is a human brain, with a face appended to it — if the truth goes in the ear and is attended to by the rational centre, it will go to rational centres in the brain, and because the rational centres are only formal centres, they will never become work. You will never get a benefit from anything that remains merely at the level of reason. The rational part of your brain has no direct contact with your motivational centres. It has no power to give an order to your organism and make it act in accordance with reason. So that if you hear things, as this note suggests, where it says, even just by listening without any meditational work you should expect to resolve many inconsistencies in our psyche. We shouldn’t, because this should, this imperative, implies that we have the power. And this power can only work. If it doesn’t work it is not producing results. If we listen all day long, or if we listen for years to certain truths, these truths will never by mere listening become operative in life. The idea in the rational centre cannot become an essential factor of behaviour ... it cannot become a saving form in life unless that idea is empowered by feeling. If we took the brain as containing an intellectual part, and an emotional part and a conative part, like a man has the head and the chest and the belly, then you can say inside the head there is a little man with a head a chest and a belly. The forebrain is like the head, and the middle parts moving to the sides are like your lungs and emotions, and the back part is like the conative drive in the belly. Now if you put it only into the head part, into the intellectual centres of the brain and you do not empower it with emotion, if you don’t feel, if you don’t charge it with emotion, it will never, no matter how true it is, modify life. It will not remove inconsistencies in the psyche. What it will do is give you a false appearance that inconsistencies have been removed, because it will remove inconsistencies in the rational centre. But the rational centre is only concerned with ideas. And an idea, if you remember, is simply a form, which we indicate by drawing a circle. If we like to distort the circle, wiggle it about a bit, nevertheless because the line that we have drawn meets itself at a certain point, it has surrounded a zone, and in surrounding it, it has become a form. Form means individuation. It means enclosure. And when you enclose, if you concentrate on the form of the enclosure and not on the feeling, you have reduced yourself, at the moment of identification with the form, to a mechanical entity. That is, you cannot, if you once accept the definition of a term, whether in mathematics or geometry, or in logic, if you once accept this definition, then the rest of the processes conducted in the intellectual centres are entirely mechanical. So, given a certain proposition and the rules of logic, the brain must come to a certain conclusion ... this by necessary mechanical development. But this mechanical development is not life, and it never gets outside the intellect. If you wish to break outside the intellect and start to live, then you have to use the energies that belong specifically to the life force. And these energies are emotions. So that by listening alone without meditational work, we really should not expect any change in the psyche. We can expect a change in the intellect, because by simply listening, ideas, definitions, begin to knock each other about internally. If you remember the Herbartian Psychology, about the way ideas strive for the threshold of consciousness: each form which you have learned, generally as a child without a proper definition, has a loose relationship with other verbal forms in the intellect. But the more work you do in definition — that is, the more you turn your vocabulary from the passive into the active phase — the more these ideas begin to integrate mechanically. So that a person can understand the truth of the universe intellectually. We’ve seen it with, say, Confucius, Plato, Pythagoras, and so on. Men who believed rationally that they had solved the form of human relationships for the human race, and who believed that by means of their reason they could govern a state. You know what happened to Confucius when he was given a territory to govern. He made a mess of it. We know what happened to Plato when he was given a territory to govern. He made a mess of it. We know what happened to Pythagoras when he got his logical view of society. He was chased away, and his disciples had their goods confiscated, and some of them were done violently to death. Simply because they had an erroneous idea that if they had a consistent group of ideas pertaining to social relations of human beings, that these ideas equip them to rule society. Factually they don’t. There are lots of beings who exist at levels other than the intellectual, who refuse to be dictated to by intellectuals, and who live by an emotional response and by sheer willpower. And the Emotional response and the Conative Will response cannot go under the dominion of the Intellect because the intellect has all its energies involved in ideas. And because they’re involved in being an idea they cannot operate ... other than as ideas. So we can say if we are listening to a truth — if we really want it to be effective — we must learn how to charge this truth with emotion. We must make this truth, this idea, hot with feeling, and we must then force ourselves to apply this thing in action. So that we can all understand what it means — uh, the two first commandments, Love God, and the Neighbour as yourself. It’s a nice proposition. And most clergymen would call this a counsel of perfection. Like the, Be ye perfect, as your father in heaven is perfect, is a council of perfection. The intellect recognises its truth. Everybody nods the head, the intellect, at it when they see it, but this does not affect their lives at all. So that the bishop can complain that for 2000 years people have been exhorted in this way to behave properly, and these 2000 years of exhortation have produced no effect. They’ve produced no effect because they have gone through the ears in a verbal form into the intellectual centres where they have promptly gone to sleep. We know that practically all civilised people believe in what they call decent behaviour and fair play. Even businessmen believe in what they call trust ... mutual trust in business. But at the back of all this mutual trust is the law court, and the army, to enforce any defaulter not to default. We find willpower and feeling supplying the energies to make an idea into a life-operative force. This is to answer anyone who feels something dramatic in the form of exercises is required. Now it’s obvious that the formulation of this question implies that some other being, other than the writer of this question, requires something dramatic in the form of exercises in order to develop. But it may be that the thing that is here called something dramatic actually means something should be done. That is, there should be an emotional charge in the situation. ... then we should find increasing harmony in conditions, even if we allow that it may be a function of the environment to test us. This says again that if we listen intellectually without doing any work on ourselves, without emoting, we should expect conditions to change, and for them to become more harmonious ... even if we allow that the environment is supposed to test us. So to sum up here we must say, that to avoid the insectification or segmentation of man, we must, when we have an idea, feel the meaning of this idea, and then we must apply our Will to it. MUST if we are to develop. This MUST is a substantial imperative coming in a being ... providing that being has given himself to the idea of self-discovery. He’s going to discover the meaning of the substance of his own being, and therefore MUST occurs to him. He MUST. That is, substantially he is driven to discover the conditions of his own being. And to do this he must interpret the environment as an occasion for disturbing the harmony he has already attained at the intellectual level, because if it does not disturb it, it can only mean that he is in the groove ... that he has not yet transcended the formulation which he has attained. And as life happens to be infinite, the only way that one can get more life is by transcending the already existing, harmonious formulation of ideas. Well, the thing to be gained is to realise that first of all, the statement that the imagination is not nothing — it is a certain amount of energy in a certain place — is true. Remember that the MAG in imagination is from an Old Persian word which means your primary appetite, your substantialised energies which are moving towards gross materialisation. So in the word MAGic we find the same thing. The I MAG is the same as I MAKE. This MAG is the same word as MAKE. So the imagination is a definite amount of energy in a place. Let us draw a place. The symbol of a place is simply a circle. We can wiggle the circle about like we did this, or we can wiggle this circle into the shape of a man’s head. Whatever we do with it, the essential thing about it is, that it has enclosed a zone, and that zone is not nothing at all in any negative sense, but is a zone that has trapped energies. But if we insert further energies into this closed sphere — as the dreams say — if we put more energies into it, the amount of reflection inside it increases, and at a certain critical point there will occur a process of spontaneous precipitation ... the crystallisation of a form. Now this is the way the gross material world has actually been developed within a field of forces, which by condensation, by compaction on a centre, have brought the form that was previously not sufficiently intense to become gross which [up to this point had] existed at the subtle level, has by excessive input of energy been turned into a gross material being. When Shakespeare says, We are such stuff as dreams are made on, he is saying the same thing as this particular dream says. If we imagine that this paper — as we usually do [during his talks, Eugene invariably has a roll of paper on which to draw his accompanying illustrations] — is illustrating with its motion the motion of the continuum, that the paper is extended infinitely, and have an infinite continuum of motion. 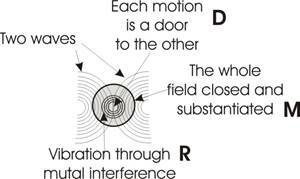 If we now say that wherever motions cross and pass through each other, as a wave going one way and a wave going another, where these waves are passing through each other, we can use the letter ‘D’ to signify that one is acting as the door to the other. This is a division of space by motion. And when we look at the intersection points of any two motions, we see that where they mutually interfere, they vibrate. And this is the letter ‘R’. The trembling of the vibrated ‘R’. And when we consider the whole field of this as closed and substantiated, we write the letter “M”. for this division of actions. for the vibrations arising from the opposition of the forces. for the substantialisation that occurs when these crossings are circumscribed. And the whole thing gives us the word dream [DR-ea-M]. Now you’ll notice if we read this boustrophedon as the Greeks would have read it, we get the root of another word, which we all know in the word MURDER. And it means to kill. It means to take a substance, to vibrate it violently and cause it to disintegrate. This means that we can look upon the dream in two ways. The Function of the Dream. The dream is always creating a form and destroying another form before it. When a dream occurs, it occurs in a psyche that has a problem to solve, and the problem is the status quo with which the psyche has entered into sleep. And the dream is the disintegrating of this status quo in order to release the psyche from the tyranny of that form. And in the dream a solution is offered. And if this dream is energised very, very strongly, then the next day, the action pattern of that person will be different. The dream will have energised the next day’s behaviour. Now we know that the physical body doesn’t need any sleep whatever in the psychological sense. All the physical body needs is relaxation. If you relax your physical body and allow the circulation of the blood to clear away the toxins, the by-products of activity, your body as a physical machine has received all it needs. But sleep has another function than resting the physical body. What it has is the function of releasing the psyche from identification with a series of forms that it has fastened onto in its waking state. Now, the psyche cannot change unless it falls asleep in relation to something. If we look at this root here, the root called morph, in morphia, morphius means sleep. But morph is the word form. Now you can see that if you change the P.H. into F., all we have to do is respell this word and it spells the word form. And it says that just as a caterpillar cannot become a butterfly without going to sleep, so the metamorphosis, the change of form, is a change in sleep. When you have let go of the form you have been identified with, the energies of it now begin to reaffirm their true relation with the field force — the continuum of Sentient Power — that they had before the superstress was placed upon them. So that at the moment of letting go of an idea completely, it lapses into the sentient power field, and it there vibrates and it makes new connections. So that when you again look at that idea it brings with it a host of new associations. And this is the function of the dream. and breathing out of that differentiated zone. These are the two aspects of it. An energy in the body is differentiating the field of that individual, and creating new substantial tensions ... new resonances. And out of these new resonances, new emergents of action occur, new patterns that would otherwise not exist and these new patterns now become the forms which guide the next day’s activity. Now, daydreaming is a state intermediate between sleeping dreaming and the waking state. And you know that all geniuses, all artists, all great thinkers have factually lived in this half world of the daydream. If we like to make a little graph of it, we can say, there is the line of death at the bottom and at the top here is pure spirit which is absolute life. And between these two there’s a hierarchical order of forces. On the middle line here, we can write anger. On the bottom line, death. On the top one we can write joy, on the apex. Between anger and death we can write depression. And between anger and joy we can write — we haven’t got a word for it — we can write, ambition if you like. Now we have a hierarchy of emotions here. When you have perfect unity at the apex of the hierarchical pyramid, you have joy. This word JOY itself means the Affirmation of the divine state. Right at the bottom we have DEATH, a state of Identification with that which has been disintegrated. Immediately above the death line we have DEPRESSION - which is a movement towards death. And above the depression line we have ANGER. Above this we have this AMBITIOUS POSITIVITY — we’ll put POSITIVE — towards life. And at the top level we have ATTAINED. Now, we have to pass through from the death to the joy in life at the top level, and to do this we have to go through a variety of near deaths. And we have to do this as consciously as we can. And when you go to sleep at night, you ordinarily lapse from the identification with your governing concept of yourself, and you float away in the relatively amorphous state in which dreams come up without any control. And they lapse again so that when you wake up in the morning you can’t remember what you were dreaming about. Even if you do remember, it will probably fade within an hour or two, and then you won’t remember. Now, the unremembered dream is not much use to you, because it has determined your action without your being aware why and how it has determined you. And if you practise the daydream consciously and deliberately, you are doing something quite different. If we say — we draw another hierarchy now and say — and put death at the bottom and we’ll put sleep, dreamless, dreamless sleep and we’ll put dreaming sleep there, and then above that we’ll put daydream, and above that we’ll put full waking consciousness. Now in Yoga you have this statement of the waking state, the dreaming state, and the dreamless sleep state, and the beyond. Now, the full waking state is the state of the psyche when it is absolutely self conscious. And the ordinary state that most people spend their time in, is the state of uncontrolled daydreaming. And the thing is to turn this uncontrolled daydreaming into a controlled daydreaming. In other words to make all the forms that come in the mind have a positive direction, so that they can actually be used. Now in order to do this, all you have to do is put yourself in a state midway between the waking state and the state of dreaming in sleep. You start dreaming while you are awake. And the ordinary method, the mechanical method of doing it, is first of all to make your physical body comfortable. In the initial stages of the exercise of course, you would lie down and you would take care that you didn’t fall asleep. One of the biggest obstacles to yoga is falling asleep. Now the funny thing about this looking-at-things-that-you-don’t-like: if you are in a positive frame, the fact that you don’t like them helps you to keep awake. Now by a supreme effort you can keep your eye on them and yet remain awake, so that you can actually integrate the forms that would ordinarily be presented in sleep and lost into the rational mind. That is to say, you can involve and integrate into the intellect, elements that ordinarily would never reach the intellect, namely the painful, the unpleasant emotions, which have been excluded from the intellect precisely because they were unpleasant. · and then by carrying on with your ordinary work, still relaxing. So that you can actually do an ordinary day’s work, if you want to, and at the same time you are living in a half world. You’re watching the associations of the external environment acting upon the inner environment that would ordinarily only be revealed in the dream state of sleep. Now its content is being revealed in the daydream, the daydream is not now a waste of time. The daydream is actually the source of all inspiration. The dream that’s had only in the night and isn’t carried through into the day, produces no discoveries, no inventions. But the dream that is carried through into consciousness becomes a reality. And thus the statement made in this question is about the imagination. The Two Ways to Empower a Daydream. If you empower this daydream it becomes a reality. Now, there are obviously two ways in which you could do this. One is immediately, by the empowering of the form of the dream, to precipitate this form into gross material existence. And this would produce a new form without any preamble. There would be no lead up to it. Something like the sudden appearance in the room of a nice Ming vase that you had deliberately imagined because you wanted one, and you had so empowered it that the thing materialised. Now this is one of the possibilities. And we have sufficient evidence today, in poltergeist phenomena and other things, to know that this kind of thing is a possible. And this is the kind of thing that is frightening and to which this person is referring, when he says, On doing this I became frightened and woke up, because the dream form appeared to materialise. But the other way is the way that all inventors have used, and which is quite safe. It frightens nobody and yet is the same in principle. That is, when you daydream and you empower the daydream, the daydream will give you the form and the function, and the know-how to copy with material substances the form that you have seen in the daydream, and thus produce an invention. Thus the motor car engine is simply a precipitated dream. Where, instead of precipitating by direct magic the fiat, Let there be motor car engine, there has been the simple looking into the dream world — the daydream world — seeing the form of this reciprocating action of various parts, looking at them very, very carefully and then copying them in the appropriate metals and producing a copy of this original in the subtle-world daydream. It’s obvious that the second one [method] doesn’t frighten anybody much and yet it’s the same in principle as the first one. And we would probably recommend a long course in the second mode rather than the first, to avoid getting too frightened. Thus the mere fact that you can close your fist, having declared that you will close it, shows that the will in you can have some sort of influence on the physical body. And it’s a simple step from that to state that likewise I might contract some tissue in my body and hold it in a state of tension like I hold my fist, and thereby cut down on the circulation in that zone, oxygen-starve the cells, and cause the cells to break down by simply oxygen-starving them. This is actually the origin of many internal breakdowns, a simple tension like holding the fist tightly, localised because of the symbolic meaning of that part of the anatomy, and then the slow starvation of the cells ... until finally they break down and corrupt. It’s easy to see that in the living organ. Where it becomes difficult is when you imagine that there is something — something which in fact does not exist — the existence of an absolutely non-sentient gross material. The idea that there is a matter which is not Sentient Power is deeply ingrained in man, and it is ingrained in him because of a certain necessity of release from fear. The ancients, who were animists, didn’t have this sensation at all. Neither do little children. The primitives have a sort of identification with nature, so that when a tree waves a branch they are sure that it’s waving deliberately, as if they were to wave their own arm. And so they people the world with spirits which move in this way, and they live in a state of perpetual fear because of what these spirits might do. Now in order to get rid of this primary fear of nature — of nature’s spirits — man deliberately taught himself to think mechanically. He tried to find an explanation of the movements of natural causes that would deprive them of any psychic intent. Now it’s obvious that nature conspired with him in doing so ... because when you let go of a stone it goes to the ground, and a bit of practice shows that it repeats itself, you can attribute its descent to the ground to a non-sentient force which you can call gravity. And you can say then say that this stone is now falling because it can’t help it. But to guard himself against this belief, the primitive man gradually learned to think mechanically, until we have been conditioned to think that nothing can be done with a merely mechanical entity like a gross material body. And this would have been all right if it hadn’t been for the work of certain research specialists like Jagadish Bose who, having proved that the responses of the animals is found in the plant, and that the difference between the plant and the animal is a question of relative velocity of processes and some degree of sensitivity, then goes on to studying the tiring in metals and the general behaviour of matter as such, and shows that the response from the so-called inorganic world is of the same order — if not of the same intensity — as that of the so-called organic world of the plant and animal. In other words he proves — and he gets the Nobel Prize for doing this — that there is no absolutely inorganic matter in the universe. So the little girl at puberty who is locked up and her mother won’t let her play, and who lies on her back in bed apparently in a deep coma, and is meanwhile throwing vases off the mantelpiece in the next room, has really appealed to the psyche of the material with which she is dealing and said, Please connive with me against mummy. I don’t like her. You’re her favourite vase. Please jump off the mantelpiece onto the carpet, and so on. Now this direct action of psyche on psyche is easily conceivable. The direct action of psyche on a non-psychic material is inconceivable, and therefore the primitives gradually moved towards this mechanical interpretation of the world, to rescue themselves from the possibility of magic. And this possibility remains. We see it in the psychosomatic disorders, and we see a strange thing like a man saying, Yes, I can believe that the psychic state could influence a muscle form, or an organic function. And yet he says, I don’t believe it could influence bones. And yet, factually, bone is just as much alive in a living being as the rest of his body ... and bones in fact do change. Not many years ago it was more or less current to believe that your skull had fixed itself more or less permanently and rigidly by the time you were in your early twenties. Now, this isn’t true. If you go on developing in certain ways certain faculties, your skull will be modified to make room for the new development — because the calcium in the bones and other minerals involved with it are not absolutely inorganic — they are working expressions of sentient power. To revert to this problem of the dream, in the dream it appeared to this person that if you energised a dream form, piled energy into it, it would produce a gross material expression of itself. It would objectify as a gross material body. Well we can say, it would, given the conditions of super-energising in the dream form, a gross material object would appear, corresponding to it. And therefore the deep fear arising in the psyche that this possibility might become an actuality, and hence the psyche says, Wake up out of this dream, you can’t afford to believe it, because some of the things we might be imagining, or even some of the things our dearest friends trying to help us might be imagining, might be highly undesirable, and therefore we had better not believe in this possibility. Nevertheless, our desire to disbelieve in it, is not the same thing as the proof that it’s impossible. 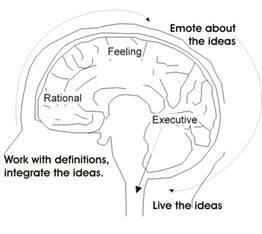 The idea as defined, the idea expressed in verbalisation without an emotion, can never get into action. But if you get the idea, and you like the idea, and you make yourself dramatise the idea, and you heat yourself about the idea ... then the idea will go into action. And the funny thing about it is that it will not only mobilise you, but it will mobilise every other person in the world whose behaviour is required to objectify precisely this form. Now the necessity for this dramatisation of the idea is the root of religious rituals. The rituals of Catholic Church, or the Anglican High Church, or the Hindu church, or any church whatever ... where they have ritual, it is in order to give a support to the emotions, so that the emotions can push themselves into the ritual form. And a ritual that remains merely at the intellectual level — without this emotional importing — is a complete waste of time. And it is that kind of intellectual ritualising, producing no factual difference in the daily life, that has caused most people to become disgusted with church rituals, and to believe that they do not in themselves work. Well, of course they don’t work. Only emotion works. In a magical ritual you have a series of little implements — just like they have in a Catholic ritual or a Buddhist ritual — and each instrument you have has a significance. And when you pick up that little sword in a magical ritual you should say, That sword is equivalent to my tongue, whereby I cut the world and order it. So that when you when you pick up that sword you should feel, With this sword I cut the world. And you must feel this emotionally. Now it’s obvious that when you are doing this emotionally, you are vibrating the psyche in a far more efficient way than if you are merely intellectualising ... because the intellect is not a very high-energy mechanism. The intellect ordinarily does not overheat you when use it. It doesn’t make you feel terribly hot if you say, twice one is two. But if you pour your feeling into the twice one, so that you discover who the two ones are, and what they are doing there together, then the thing begins to develop heat. And this heat is the same thing as transcendence. Just as a cold iron ball will have very little influence on the environment but a hot one begins to influence the environment, so a highly emotionally charged idea influences the whole field of the ideas in the psyche, and therefore forces them to respond and thus produces a new pattern, a new view of the world that is needed. So we see that as long as you are confining yourself to cold absorption of intellectual propositions, you are stocking the intellect with mechanical form that cannot of itself pass into life and become of any use. But it can be a hindrance, because it can give you a false sense of harmony, of work done ... simply because your ideas are no longer irritating you. And this is a kind of death. It’s the death of the intellectually comfortable person who has made a watertight system, a world view which cannot be shaken because he won’t have it shaken. Because he will see that it is not shaken, because he will never expose to an emotional attack. Shortly then, we can say that all the ideas that we have, if they are to become effective, must be charged with emotion. And this emotion must so lift them up that they pass spontaneously into action. Now you’ve probably seen films of Dervishes and various sects of people in the last year or two, which have been shown, and you see in all these cases how they start with a simple form of action ... that is, an idea. Then they begin to pile energy into the action — whether it’s simply shaking the head or twirling round and round — they pile energy into it, and the energy, as it begins to pile up and up and up, overheats the body, and at certain critical points, for those who actually energise it in this way, they have a transcendent experience. They see the world in a different way. That kind of method is like making yourself punch-drunk, and you can hallucinate yourself sheerly mechanically like that. Now better than that is the method of Yoga, which aims at using the breathing to emote with. Now you’ll notice that breathing is very, very closely related to emotion — apart from young men breathing down the necks of girls to increase their responses. This kind of accelerated breathing overheats the body. This heat becomes interest in the idea, the idea itself deserves my attention and I breath hotter and hotter and hotter and I know that if I get hot enough this idea will suddenly melt and it will make all sorts of funny patterns and it will bring itself into relation with other ideas outside the conscious zone with which I started. Now emotion is intimately connected with the lungs and the breathing, and with the functions of certain zones in the head other than intellectual. And therefore emotion and breathing can be brought together to bring an idea from the merely intellectual level into a functional imperative for life. Yes, because the hallucinated person normally is very apprehensive. He’s trying to stop it. He’s not trying to encourage it. When you speak of these chains of association which you think of with an unpleasant nature in daydreaming, are they a sort of subconscious perception of a motivational nature? Yes. They are actually buried intents that are not normally faceable because of their antisocial implications. And yet these things have got to be allowed into consciousness before one can be released from them. To what extent can erroneous terminology in the planned action have effect in the psychosomatic breakdown? A very, very high effect. Misunderstanding of terms, specifically of religious terms or moral terms account for a very, very high percentage of mental breakdowns, because the terms are emotively charged. So if you get an erroneous idea, charged emotionally, you’ve got a very bad determinant of action. Dichter, in his book on motivational research, discovered empirically that certain substances were better for certain objects. Wood for furniture was better than steel for example. The fact that these things were obviously animated. He discovered this empirically by questioning a number of people in his attempts to find out what motivated them. This is because he’s talking about life preferring life. It prefers an organic response and a so-called inorganic response. Yes, I was thinking in terms of what you said about there being no absolutely inanimate masses; that certain of them obviously have field activities which were more in keeping with the particular forms that they were used for? Yes. One of the ways of converting yourself to the belief that metals for instance are not absolutely inorganic, is the peculiar oleous nature of metals ... because in the whole of the organic world, oil is generated only out of love. That only in so far as the being loves life does it create oil. And the millions and millions and millions of gallons of the oil that we use to drive diesels or extract petrol from to drive cars, is simply the oil made by animals long ago ... simply because they loved life. So there’s a very peculiar relation between oil and love of life. And when you feel a metal as oleous and remind yourself that this oil is the evidence of love, you see that in a very peculiar sense, the Saturnine impression that has pressed on that matter, somehow tried to squeeze the life out of it, and it’s appearing as a film, on the surface, of oil. And where you get a mineral that is on the surface very, very dry, you know that under the appropriate pressures it too will start perspiring in this way. So there’s a hidden oil in everything that exists, because the will to exist is part of the oil. It’s quite a surprising thing to people who don’t ordinarily think about it, to realise that all the motive power in the world is love ... including the petrol in your car. This has actually been made by animals that were making it because they were in love with life. Another method of becoming aware that the inorganic world is an illegitimate abstraction is the fact that we can assimilate into our organic life these minerals that are supposed to be inorganic, so they actually are organic in us. And we know that many things that were thought to be inorganic — like the chalk cliffs of Dover — are known to be deposited entirely by animals. A few millions of years of living forces has converted energy into a material form which is organic before it’s deposited, and appears to be inorganic. In fact when we look at the word inorganic and translate the word in not as a negative but, being within, then the work, the org within, means that an inorganic being is simply a being that is organic on the inside. We know this is true of an atom, where the apparent inorganic nature of it simply means that the electrons or protons or whatever is composing that atom, are rotating, and confining their effects to a closed system. This is the meaning of the in-organic. So the inorganic is still organic, only its organic action is held within the closed system ... which is how Hindu philosophy looked at it from the beginning. And it is that that led Jagadish Bose to his experiments, because he did those experiments on the basis of the lead given by Hindu philosophy ... that there is no absolutely inorganic matter. Or, as Paul says, There is no death. Jagadis Chandra Bose was a Bengali scientist: a biologist, a physicist, a botanist and a writer of science fiction. He is considered the father of radio science as he was the first person in the world to demonstrate wireless transmission of electromagnetic waves after returning to India in 1885 (although he did not patent this invention, which was brought out by Marconi two years later). Bose then demonstrated how plants responded to various stimuli, demonstrating the electrical nature of this conduction. He is considered a pioneer in the field of biophysics. Bose went to England in 1880 for his further education. Initially he had plans to compete for the ICS, and then to study medicine, but enrolled in the Natural Sciences tripos at Christ's College, Cambridge. He received his BA in 1884 and then obtained a DSc from the University of London. He later received an honorary degree from Aberdeen University. Bose returned to India in 1885 with a position at Presidency College, Calcutta. He returned to Britain and Europe a number of times to lecture. For example in 1914, he lectured at Oxford, Cambridge and the Royal Institution. During this visit he had a private laboratory in Maida Vale, London, where various European scientists would visit Bose. He was founder and Director of the Bose Research Institute, Calcutta, in 1917. He was knighted in 1917, and made a Fellow of the Royal Society in 1920 (the first Indian to become a fellow for science as opposed to mathematics). Sir Jagadis Chandra Bose had two of his pioneering books published. Response in the Living and Non-Living: published in 1902, and Plant Responses: 1906.